William B. 'Bill' Lenoir's NASA portrait taken prior to his first and only spaceflight, STS-5 in 1982. Thisstory was updated Aug. 31 at 10 a.m. ET. FormerNASA astronaut William "Bill" Lenoir, who flew aboard the firstoperational mission of the space shuttle in November 1982, has died at age 71. Accordingto family members, Lenoirdied Thursday after suffering head injuries during a bicycle accidentearlier that day. Lenoir,who was selected by NASA for its sixth astronaut group and second class of"scientist-astronauts" in 1967, did not fly in space until 15 yearslater as a member of the STS-5 crew. Lenoirserved as the first flight engineer during the Nov. 11, 1982 launch, aidingcommander Vance Brand and pilot Robert Overmyer from his seat on Columbia'sflight deck. Five days later, when it came time to return to Earth, he tradedplaces with fellow mission specialist Joseph Allen,becoming the first to experience a shuttle re-entry from the orbiter's middeck. Lenoirand Allen were scheduled to establish another first together ? the firstspacewalk from the shuttle. But the outing was delayed a day when Lenoir becameill, was and ultimately canceled due to mechanical issues with both of theirspacesuits. TheSTS-5 mission successfully deployed its two communication satellites, the firstcommercial shuttle payloads, leading to the crew displaying a sign dubbingthemselves the "Ace Moving Company" with the motto, "WeDeliver." Afterlanding on Nov. 16 at Edwards Air Force Base in California, Lenoir and histhree crewmates had logged more than 2.1 million miles (nearly 3.4 million km)in space. For Lenoir, the mission's 81 orbits would be his only spaceflightexperience. Lenoirwas offered another mission, the STS-61A flight in October 1985 that flew the German-managedD1 Spacelab aboard orbiter Challenger, but he ultimately declined citing thetime that training would require he would be away from his family and hisdesire to start a new career. Lenoirleft NASA'sastronaut corps in September 1984 to join the aerospace management andconsulting firm Booz Allen Hamilton of Bethesda, Md. Hereturned to the space agency five years later however, becoming AssociateAdministrator for Space Flight under NASA Administrator and fellow astronautRichard Truly. Forthree years, Lenoir oversaw all U.S. manned missions from the third shuttleflight to follow the loss of Challenger through the maiden mission of orbiterEndeavour. LeavingNASA for a second and last time, Lenoir rejoined Booz Allen Hamilton in 1992 asVice President for Applied Systems. He remained in that position for eightyears until his retirement in April 2000. William Benjamin"Bill" Lenoir was born March 14, 1939 in Miami, Fla., which wouldlater establish him as the first native-born Floridian astronaut. A descendantof General William Lenoir, a Revolutionary War officer, he developed an early interestin math and science. Heearned his bachelor's, master's, and doctorate degrees in electricalengineering from the Massachusetts Institute of Technology, where he alsotaught, first as an instructor and then as an assistant professor. In1965 while at MIT, Lenoir also worked as a researcher and investigator onApollo Application experiments, which would evolve into the Skylab spacestation. Joining NASA two years later, he would continue this work from insidethe agency. 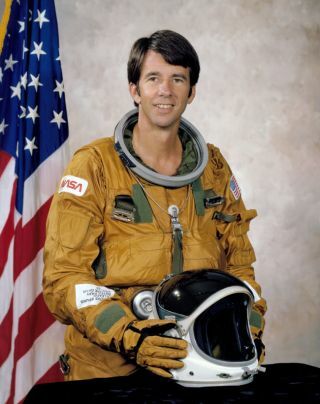 Forthe decade and a half between his being selected as an astronaut and his flyingin space, Lenoir served as a back-up crew member for the second and thirdmissions to Skylab, coordinating solar observations for the latter as Capcom,and later leading NASA's Satellite Power Team, investigating the potential ofadapting large-scale space power systems for use on Earth. Beginningin 1976, he was involved in the development of the space shuttle, in the areasof orbit operations, training, extravehicular activity (also known as spacewalking),and payload deployment and retrieval. Lenoiralso completed a 53-week flight training course at Laughlin Air Force Base inTexas, ultimately logging over 3,000 hours of flying time in jet aircraft. Arecipient of the NASA Exceptional Service Medal and NASA Space Flight Medal,Lenoir was a senior member of the Institute of Electrical and ElectronicsEngineers and the winner of the Carleton E. Tucker Award for TeachingExcellence at MIT. Twicemarried, first to Elizabeth May Frost, whom he met as an undergraduate, andthen Terri Waite, a retired NASA engineer, Lenoir is survived by three grownchildren. Editor'snote: This story was updated to correct the day of Lenoir's death based onupdates from family members.